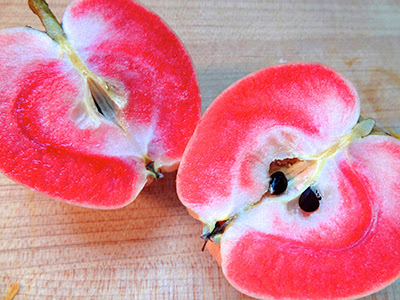 The Pink Pearl apple is an apple cultivar developed in 1944 by Albert Etter, a northern California breeder. It is a seedling of "Surprise", another redfleshed apple. Pink Pearl apples are generally medium sized, with a conical shape. They are named for their bright, pink flesh. They have a translucent, yellow-green skin, and a crisp, juicy flesh with tart to sweet-tart taste. Pink Pearl apples ripen in late August to mid-September.